I’m a child in my mother’s garden. Flashes of color and light dance as I hold my first kaleidoscope up to one eye, close the other eye and find a source of light. The rest of the world disappears while I endlessly turn, turn, turn. The light transforms broken bits of colored glass into perfect rays of symmetry. Identical triangles recede into the mirrors, creating vibrant patterns that effortlessly change as I spin the tube. My heart beats in wild delight at the endless play of animations. I slow the spin, watch for an exceptional shape and stop. The momentary pattern is fragile and can collapse in an instant, so I hold very, very still. Even then, precision is required. Who would imagine I was igniting a life-long passion for the swirling patterns of light and color born on a summer’s day so long ago? 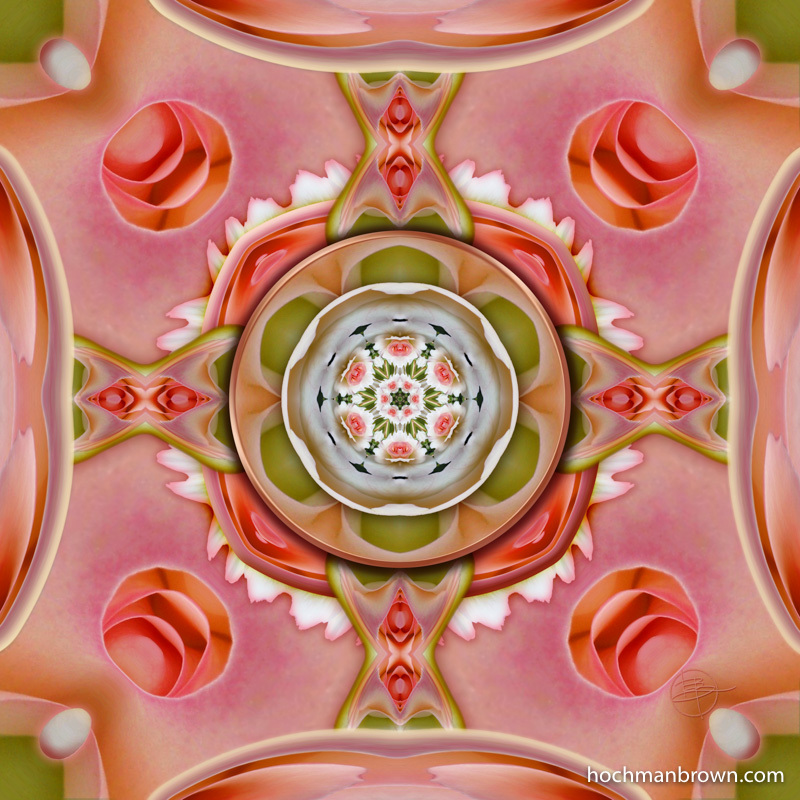 Today my kaleidoscope is more complex. Computer software and hardware replace the simple tube of cardboard, glass and mirror. I sit with a stylus and keyboard, watching the show unfold as I turn, layer and spin the reflection from one of my photographs, brightly illuminated in my monitor. No longer restricted to a three-way reflection or a flat mirror, I romp through polar space, fiddle with fractals and play in the realm of infinite images. From one of my photographs, I pull out the metaphorical “broken bits of glass” and turn these into my own kaleidoscopic imagery—spinning, nudging and shifting these flecks of light until, like that child on the lawn, my heart beats wildly and I become lost in the endless dance of color, light and shape. After buying her first Macintosh computer in 1984, she tightened the interconnection of art and math via the medium of technology by taking classes in computer-based graphic design at the University of California, Los Angeles and Art Center College of Design. 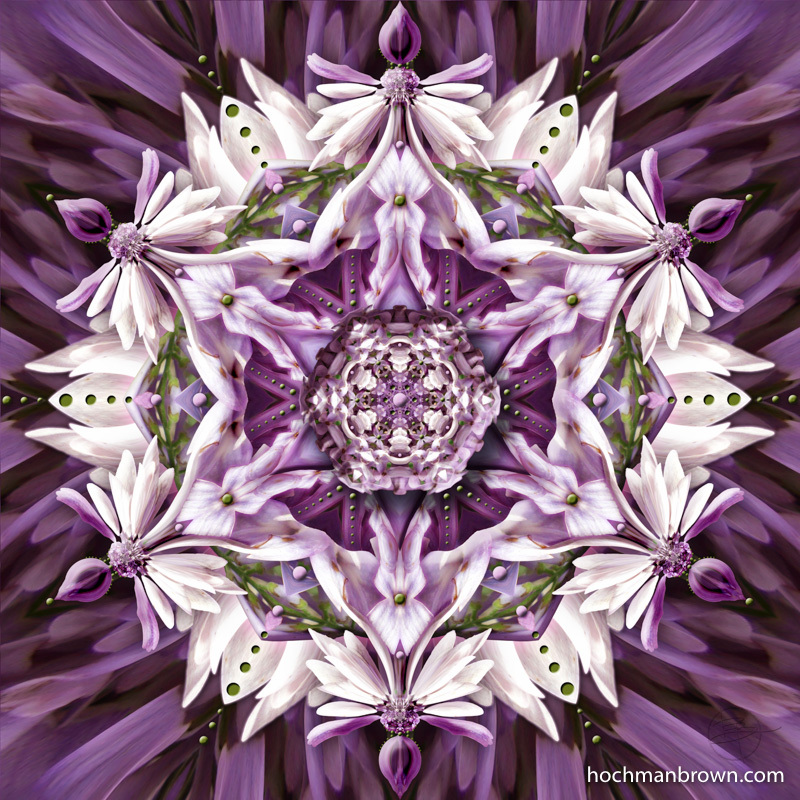 Using her years of education and experience, Hochman Brown currently creates digital art that explores “hidden worlds” within manipulated reflections of flower imagery by using fractal geometry-based software. 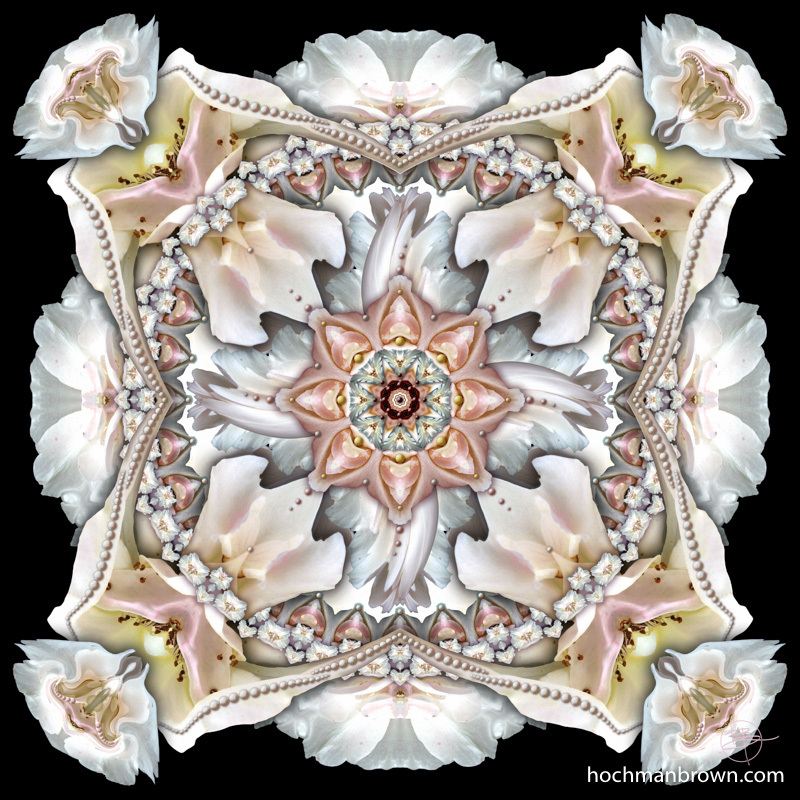 Her mandala-like works begin with photographs. 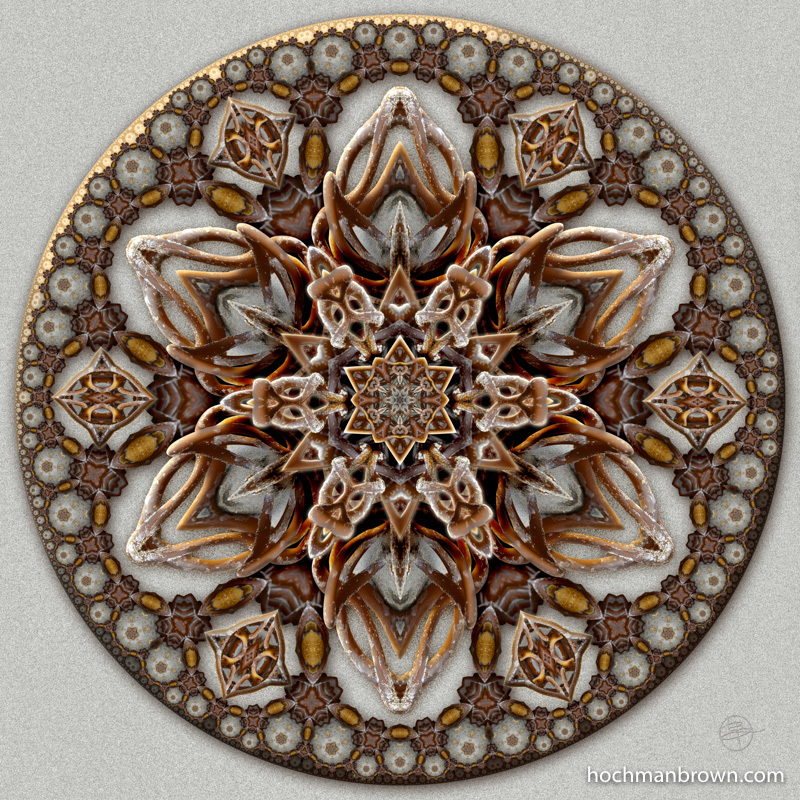 She then spins and adorns them into digital prints mounted on aluminum. Layer upon layer of detail come together to make one image. She meticulously alters light and shadow to create an illusion of depth. In many cases, dots are added for emphasis and direction. Hochman Brown has enjoyed a multi-decade career in the arts. She currently serves as artist-in-residence at the Los Angeles County Arboretum, creating artwork on the premises. Some of her digital prints are also on display at the newly renovated Gallery at the Arboretum Library.